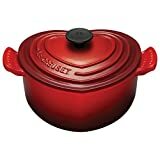 Le Creuset Signature Enameled Cast-Iron 3-1/2-Quart Round Braiser, Cherry This updated kitchen classic enhances the cooking process by evenly distributing heat and locking in the optimal amount of moisture. With ergonomic handles and an advanced interior enamel that resists chipping and cleans easily, Le Creuset's braisers blend the best of the past with the latest innovations in comfort and functionality. Most braising recipes call for searing the meats or vegetables at a high temperature, then finishing covered on lower heat, creating a natural gravy. Colorful, long-lasting exterior enamel resists chipping and cracking; interior enamel is engineered to resist staining and dullingSand-colored interior enamel makes it easy to monitor food as it cooks, preventing burning and stickingOversized handles provide even weight distribution and a secure gripErgonomic composite knobs are heat resistant to 500�FBuilt-in lid stabilizers provide a secure, no-slide fitThe lightest weight per quart of any premium cast iron cookware availableBraising uses both wet and dry heats to break down tough cuts of meat and tenderize fresh vegetables Each piece from our extensive range of high-quality enameled cast iron cookware is designed for ease and versatility of use, fitting in with all styles of cooking, all types of cooking appliances and any style of kitchen or dining decor. Please read this section before using your cookware for the first time. The information it contains will help you achieve the best possible cooking results. Enameled cast iron is a remarkable and robust material that performs well with modern requirements for food preparation and cooking. Whether you choose to stir-fry, slow-cook a casserole, sear a steak or bake a cake, there is a shape that is suitable. Cast iron performs well for either slow cooking or high-temperature searing. Cast iron can be used reliably on any heat source, including induction, and with any oven or grill. It has the ability to retain heat efficiently, which allows for use of lower heat settings in stovetop and oven cooking. On the table, a hot covered dish will keep food hot for second servings. Cast iron can also be used to keep foods cold. A chilled dish becomes an ideal cold food server on a hot summer day. It can also be placed in the freezer for food storage or advanced food preparation High heat temperatures should only be used for boiling water for vegetables or pasta, or for reducing the consistency of stocks or sauces. High heats should never be used to preheat a pan before lowering the heat for cooking. Cast iron retains heat so efficiently that overheating will cause food to burn or stick. 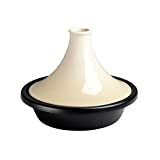 The vitreous enamel surface is impermeable and therefore ideal for raw or cooked food storage, and for marinating with acidic ingredients such as wine. Cooking tips for shallow frying and sauteing: For frying and sauteing, the fat should be hot before adding food. Bring the pan and fat or oil to the correct temperature together. Oil is hot enough when there is a gentle ripple in its surface. For butter and other fats, bubbling or foaming indicates the correct temperature. If either begins smoking, or if butter begins browning, it is too hot and should be cooled slightly before proceeding. The quickest way to do this is to remove the pan from the heat source for a few moments. For longer shallow frying a mixture of oil and butter gives excellent results. The anti-drip pouring lip prevents any dripping of food in undesirable places, and the iron handle is suitable for stovetop or oven use. The heart cocotte combines the performance and durability of enameled cast iron with a fun and joyful shape perfect for gift-giving or special occasions. Ideal in the oven, on the stove or at the table, this kitchen classic enhances the cooking process by evenly distributing heat and locking in the optimal amount of moisture. The advanced interior enamel resists chipping and cleans easily. Our 5-piece cast iron set makes a great starter set for recent graduates, newlyweds or anyone whos focusing more on cooking healthy meals. The Signature 3 1/2 qt. round oven offers all the benefits of slow cooking with enameled cast iron. Its a convenient size for serving one-pot meals or carrying side dishes to a pot-luck dinner. If a full meal is the plan, round out the menu with the 1 1/4 qt. Precision Pour saucepan and the Signature 9" iron handle skillet.